What’s the difference between Día de los Muertos and Halloween? Día de los Muertos -- also known as "Día de Muertos," or "Day of the Dead" in English -- is a holiday with Mexican origins that is celebrated on November 1 - 2. While some imagery might be close to that of Halloween, there are significant differences between the two. Día de los Muertos is a day to celebrate death -- or, more specifically, the deceased -- while on Halloween, death is seen as something to be feared. Día de los Muertos has both indigenous origins from the Aztec festival for Mictecacihuatl, The Lady of The Dead, and Catholic origins from the Spanish conquistadors’ All Saints and All Souls Day. Wait, it’s a two-day Holiday? Yes, the original Aztec holiday was actually a month long event, but when the Spanish conquistadores arrived and turned Mexico Catholic, the celebration became intertwined with All Saints Day (Nov. 1) and All Souls Day (Nov. 2). Traditionally, Nov. 1 is when you welcome the souls of children that have passed away, known as Día de los Inocentes (Day of the Innocents) or Día de los Angelitos (Day of the Little Angels). Nov. 2 is when the adult souls arrive. How do you celebrate the dead? Those who celebrate Día de los Muertos will usually put up altars honoring those members of the family who have passed away. They decorate the altars with candles, sugar skulls, marigolds, food, beverages and clothes. These offerings, or "ofrendas," are gifts for the dead and are usually a combination of his or her favorite things. Like the holiday itself, the altar also has mixed imagery of both indigenous and Catholic background. The graves of the deceased are also visited and honored with offerings as well as vigils. Would you have to go to Mexico to see these celebrations? No, although Día de los Muertos is a Mexican National Holiday it is actually celebrated in other countries as well such as Guatemala, Brazil and Spain. It is also becoming more and more popular in the U.S. due to the large number of Mexican immigrants and Mexican Americans. What’s up with all the skulls? Skulls are everywhere during Día de los Muertos. The origins trace back to the pre-Hispanic era, when they were kept as trophies and used during rituals. 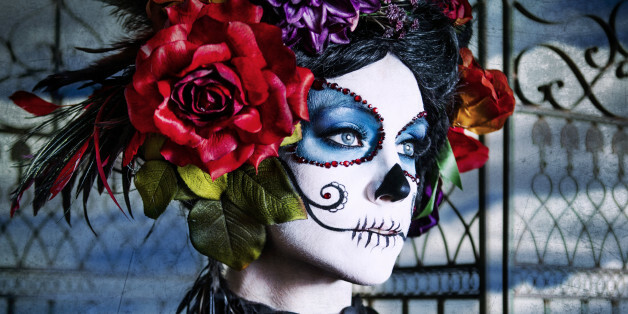 The most recognized skull on Dia de los Muertos is the Calavera Catrina. The image as we know it today originated with José Guadalupe Posada, a Mexican Artist who depicted a fancy female skeleton as a dig against the Europhile Mexican elite during the Porfirio Díaz dictatorship. It became an iconic image of the Mexican Revolution at the beginning of the twentieth century. But the actual Catrina is said to have originated thanks to the Aztec tale of Mictecacihuatl, the Lady of the Dead.